We must confront the following terrifying fact: Of the 1386 BJP MLAs now in the country, there are only four Muslims. We must confront the following terrifying fact: Of the 1386 BJP MLAs now in the country, there are only four Muslims. 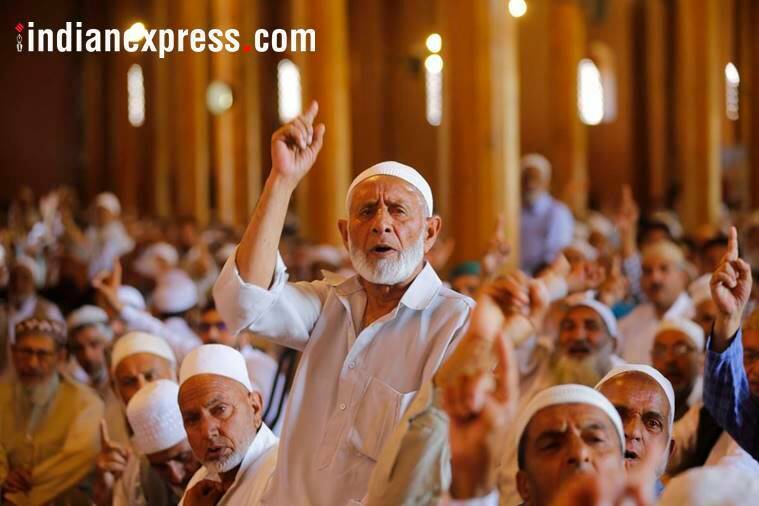 (Express Photo by Shuaib Masoodi/Representational/File)In a democracy, the majority of the citizens is capable of exercising the most cruel oppressions upon the minority. —Edmund Burke. As the nation celebrates the Republic’s 69th year, the one dangerous trend that is becoming solidified since 2014 is the political invisibilisation of the Muslim, by denying the significant minority any political space. This is key to the Hindutva project of Hindu majoritarianism and the othering of the Muslim in every social sphere. While the egregious attacks against Muslims (and Dalits) in the form of lynchings/killings have garnered expected outrage, including abroad — the New York Times, for example, has written an unprecedented 16 editorials since May 2014 against the Modi government’s embrace of religious extremism, intolerance and the curbing of freedoms — what is not so obvious is the slow elimination of Muslim political representation. Unlike physical attacks against Muslims, this political cleansing is insidious for it is executed through perfectly “legitimate” and “democratic” methods. After all, people might ask, what is democracy other than the enforcement of the will of the majority? The answer is that Hindutva’s electoral majority does not want Muslims to be politically represented. This is what Alexis de Tocqueville called the “tyranny of majority” as early as the 19th century. The last four years have seen a terrifying demonstration of this tyranny in action. In the 2014 elections, the BJP came to power without a single elected Muslim MP – in any case it had fielded only seven Muslims (5 in J & K and Bengal alone) out of a total of 482 candidates. The total Muslim representation in Parliament fell to 4%, the lowest since 1957. Muslims constitute 19.2% of the Uttar Pradesh population, that is about 4.3 crore people, as big as the population of Argentina. Yet, the BJP did not field a single Muslim candidate in the 2017 Assembly elections, which it swept with 312 seats out of 403. Muslim representation drastically fell from 17.1 % to 5.9% in the UP Assembly. In Assam, (where the Muslim population is 34.2%), the BJP has one Muslim MLA out of 61. In Bihar and Jharkhand (16.9% and 14.5% Muslim population, respectively), the BJP has no Muslim MLAs. In Maharashtra (11.54% Muslim population), the BJP won with 122 MLAs and fielded one Muslim, who lost. Since Narendra Modi became Gujarat chief minister in 2002, the BJP has not fielded a single Muslim candidate either in the Lok Sabha or Assembly Elections. If the Muslim representation in Gujarat Assembly was 6.6% in 1980 (when the Muslim population was 9.67%), the political cleansing ensured that it is only 1.6% now. The effectiveness of the strategy is that even the Congress Party does not dare utter the word ‘Muslim’ in Gujarat. All this leads to the following terrifying fact: Of the 1418 BJP MLAs now in the country, there are only four Muslims. That is 0.28% of the population, when the Muslim population is 14.2%. The exclusion is simply staggering. In a comparative perspective, in November 2014, non-BJP ruled states had 300 Muslim MLAs, representing 13% of the total MLA population. The BJP’s bogey of “Muslim appeasement” is worth examining, in the armed forces, judiciary, police and civil services, as well as in politics. Muslim representation in Parliament in the Congress-dominant era of 1952-1977 ranged between 2% and 7%. The highest representation was in 1980; even then it touched only 10%, less than the overall Muslim population. In UP, Muslim representation in the Assembly ranged between 5.9% to 9.5% in the period 1951-1977, much less than its population. Only as late as 2012 did it touch 17.1%, but again fell short of its overall population share. Even in Bihar, where the so-called “secular” Congress and Janata Dal/Rashtriya Janata Dal parties have been accused of pandering to Muslims, the highest representation was only 10.46% in 1985, when the state’s Muslim population was 16.9%. So let us not delude ourselves that the BJP is rectifying historical injustices against the majority community by reducing the representation of Muslims. The argument that the BJP does not field Muslims because it cannot find “winning Muslim candidates” is just another devious one. In order to deepen democracy, it is imperative that the most marginalized and oppressed get representation. The first step then would be to recognize that there are no monolithic majorities and minorities. The raison d’être of the Hindutva project is to deny the oppressive and hideous reality of caste and class and build a monolithic Hindu community which is deeply iniquitous in practice. Recent events from Una to Bhima Koregaon demonstrate that. Although unlike towards the Muslim, the BJP is willing to make some symbolic gestures towards Dalits. Truth is, the Muslim community is itself deeply riven by caste and class. Thus, the Ashrafs (the forward castes among Muslims, who constitute only 15-20% of the population) have been the overwhelming beneficiary of communal politics and its small gains at the expense of the Pasmandas (backward and Dalit Muslim castes). In the UP Assembly of the last two decades, as Gilles Verniers shows, the Ashrafs cornered 70% of MLA positions. Nissim Mannathukkaren is Chair in the Department of International Development Studies at Dalhousie University in Halifax, Canada.